All throughout my life I have been in an on and off relationship with professional wrestling. 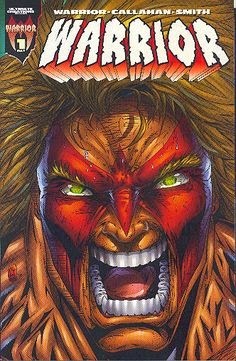 And I was a huge fan of the Ultimate Warrior, so when I saw this issue while putting away comics in the fifty cent bins at my local comic shop I just had to grab it and give it a look. I entered into reading this book with pretty low expectations. To put it nicely I wasn’t disappointed. The story is just as hard to follow as the promos that Ultimate Warrior used to cut when he was in the WWF. But what I could gather is that a man is being called to a higher purpose by some form of deity that is claiming he is the champion or “Warrior” that he had been waiting for. The deity is hinted at being the man’s father, but once again I couldn’t put together if he was truly his father. Or if it was a Donald Blake situation where Odin id the father of Thor and Donald is the avatar for Thor. Therefore Odin is Donald Blake’s father. Most of the issue is spent with the man traveling across a barren fantasy landscape and discovering his destiny to become the Warrior. And by the end you still don’t know much about the character or why it is important that the Warrior arises. But it is made clear that the man is in a coma after some kind of accident and everything in the rest of the issue was taking place inside his mind. Onto the writing by Warrior. It goes without saying that it was rough at best. It gets across that Warrior the writer was using this book as way to get across his beliefs, which are very spiritual nature. And has a strong foundation of being a warrior in every facet of life, But because of that it makes it easier to get lost or bored with where the story is going. This book was released in 1996, and the art definitely reflects that fact. The art looks like any book ever drawn by Rob Liefeld. And in my eyes that is not a glowing review, Warrior looks like he is either giving birth to a massive food baby at all times, or someone just off panel is repeatedly kicking his dog. However, unlike Liefeld, Callahan shows a very good talent with anatomy. The characters have clear hands, wrists, and ankles. And the musculature actually isn’t too far exaggerated from reality. Admittedly, the only thing that kept this issue from getting a one or less was my own personal nostalgia for anything to do with wrestling from the late 80’s and early 90’s when the Ultimate Warrior was at the peak of his popularity. Thanks for reading my review. If you have any comments, questions, or suggestions please leave them in the comments section. And as always…. Thanks keep reading comics fans.